Water at the Earth's surface and in the atmosphere exerts a strong moderating effect on climate. Generally speaking, the higher the water content in the air, the more moderate (less extreme) the climate. 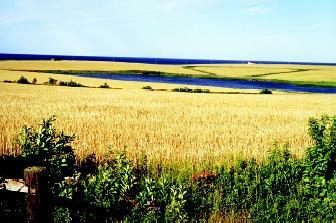 Prince Edward Island exemplifies a region with a maritime climate, moderated by the presence of the Gulf of St. Lawrence. The mild climate makes the area suitable for growing grain crops (shown here) and potatoes. Proximity to water bodies causes humidity to be higher due to evaporation of water from the water surface. All other things being equal, the greater the distance from a major waterbody, the drier the air. The ability for air to hold water in the form of water vapor varies with temperature. Hot air can have a very large water vapor content, while cold air holds very little. One measure of the actual amount of water vapor in the air is vapor pressure, which is a measure of the number of water molecules in the air compared with the number of molecules of other constituent gases in the air. Another term, saturation vapor pressure, indicates the maximum amount of water vapor that the air could hold; this is strictly a function of temperature. Relative humidity is the percentage of the actual water vapor content compared with the saturation vapor pressure. Saturated air has a relative humidity of 100 percent, whereas totally dry air (which never occurs in the atmosphere) would have a relative humidity of 0 percent. Orographic Lifting and Rain Shadows. 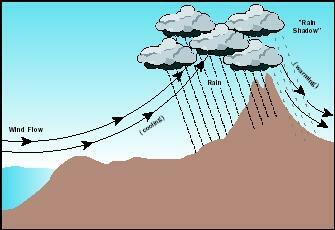 When air moves up and over a mountain or ridge, in a process called orographic lifting, it cools as it rises. (As the pressure decreases, the air "expands," and the air molecules move more slowly). If the rising air cools enough, its temperature will reach the dew point, the temperature at which air is saturated. At that temperature, condensation will begin; this is the point at which water vapor begins to be converted to liquid water, the result being clouds and precipitation. Because a steep mountainside can force air upward very quickly over a short distance, orographic lift can produce heavy rain or snow along the side of the mountain range that faces the wind, if enough moisture is present in the air. In the western United States, some mountain ranges are aligned north-to-south, with their western slopes facing the Pacific Ocean and its abundant moisture. Ski resorts in the Cascade Range of Washington and Oregon, and the Lake Tahoe region in the Sierra Nevada, for example, benefit from orographically produced snowfall. Moist air moving up the side of a mountain facing the prevailing wind causes precipitation to fall in a process known as orographic lifting. On the lee side, a rain shadow occurs, and precipitation is sparse. When the air rises to and passes over a mountain or ridge, it begins to descend down the other side. Descending air warms, and as it does, the saturation vapor pressure increases. But because no water is being added to the air, the actual vapor pressure stays the same. Thus the relative humidity becomes lower, and the air gets drier. This process causes the lee side of the mountains (i.e., the side away from the prevailing winds) to be a zone of limited precipitation known as a rain shadow. Rain shadows are major contributors to the climate of certain parts of the world. In the example above, the regions east of the Cascades in Oregon and Washington, and east of the Sierra Nevada Mountains in California, are arid as a result of the rain shadow effect. Lake-effect snow is a localized, and sometimes heavy, snow that develops downwind of large lakes. In the United States, it is most common south and east of the Great Lakes, where residents experience the highest annual snowfall totals anywhere east of the Rocky Mountains. A related phenomenon, called sea-effect snow, occurs in coastal regions when cold air spreads over warmer ocean water. In these processes, the air passing over water picks up moisture, which rises and forms clouds that produce snow. At least 80 kilometers (50 miles) of fetch (the length of lake over which air travels) is required for a significant lake-effect snow. A greater temperature difference between the air and water enhances the cloud-forming and snow-forming process, as does steeply rising terrain downwind of a lake. Wind direction also affects the snow intensity. Although a lake-effect process may not always produce snow, the amount of snow that can fall in these events can be enormous, reaching rates of 12.5 centimeters (5 inches) per hour. Parts of the Tug Hill Plateau in upstate New York receive an average of 625 centimeters (250 inches) of snow each winter, more than six times the typical amount in areas not in lake-effect regions. Water vapor is the main reason for the greenhouse effect, in which certain gases in the atmosphere allow sunlight to pass through, but absorb heat released from the Earth (when sunlight strikes the Earth it changes from visible light to infrared radiation, or heat). Without this effect the Earth would be about 33°C cooler than it is at present (that is, 60°F cooler). Human-caused emissions, leading to increased levels of carbon dioxide (CO 2 ) and other gases in the atmosphere may accelerate the greenhouse effect . Water vapor absorbs heat and releases it slowly. At night, when the humidity is high, the atmosphere retains more heat, and nighttime temperatures stay somewhat high. On dry nights, however, with little water vapor to absorb heat, the atmosphere cools off rapidly. Clouds act in much the same way as high humidity. The presence of clouds means humid atmospheric conditions, and this promotes greater heat retention, and higher nighttime temperatures, than on a clear (dry) night. Liquid water at the surface also can play a significant role in climate moderation. Water takes much longer than air to heat up, and also longer to cool, because it has much higher specific heat. Thus, on hot days, water (oceans, lakes, and rivers) absorbs heat, keeping the air somewhat cooler. When the air gets cool, however, water slowly releases heat to the atmosphere, raising air temperatures. This is why temperatures along coastlines are cooler in summer and warmer in winter relative to inland areas (see side-bar). Temperature vary more the farther inland one travels. There is some moderation of climate because condensation is an exothermic process, and warms the atmosphere, particularly in wet coastal areas (i.e., downwind from the ocean). As an example of how distance from the ocean influences air temperature, consider the states of Oregon and Washington. The Cascades Range divides the two states into a western region, west of the mountains, and an eastern region, east of the mountains. The climate of the western region is moderated by the Pacific Ocean, and is mild and moist. But the eastern region is relatively dry (the rainshadow effect) and warm, even hot. The coastal city of Astoria, Oregon experiences warmer daily minimum temperatures and cooler maximum temperatures than Pendleton, Oregon which is about 400 kilometers (250 miles) inland, and separated from the ocean by the Cascades. Astoria's average monthly temperatures also exhibit a smaller range: 5.5°C (41.9°F) in January, the coolest month (compared to Pendleton's 0.8°C [33.5°F]) and 16°C (60.9°F) in the hottest month, August (compared to Pendleton's 22.7°C [72.9°F] in July, its hottest month). Ironically, although higher humidities mean more moderate temperatures, to human and animals they feel more extreme. A 32°C-day (90°F) in Arizona feels hot, but the same temperature on a humid summer day in Washington, D.C. feels stifling. Similarly, a cold, dry day feels less extreme than a humid day at the same temperature. These effects, again, are due to water's specific heat—its ability to conduct heat (or cold) compared to dry air. SEE ALSO Agriculture and Water ; Climate and the Ocean ; Fresh Water, Physics and Chemistry of ; Precipitation, Global Distribution of . Schneider, Stephen Henry. Encyclopedia of Climate and Weather. New York: Oxford University Press, 1996. Stein, Paul. Macmillan Encyclopedia of Weather. New York: Macmillan Reference USA, 2001. National Weather Service, National Oceanic and Atmospheric Administration. <http://www.nws.noaa.gov> . A sea breeze occurs in the daytime along the shore of an ocean or large lake when air over the sun-heated land becomes warmer than air over the adjacent, relatively cool ocean. The heated air over land rises, creating a localized low pressure zone into which the cooler sea air moves (because air moves from higher to lower pressure). A sea breeze helps keep daytime coastal temperature pleasantly mild, even though inland areas may be hot. At night, the air over the rapidly cooling land becomes cooler than the air over the relatively warm ocean. Because the lower air pressure is now over the ocean, the wind blows from land to water in what is known as a land breeze. Orographic Lifting and Rain Shadows.,Lake-Effect Snow.